The new edition of Cross- Border Enforcement of Claims in the EU. History, Present Time and Future seeks to bring clarity to the legal options available to those seeking an enforceable cross border title of execution and recovering claims in the event of non-payment by the debtor. The complexity of this area is due to the differences between national enforcement systems and the level of efficient legal cooperation between the EU Member States. Mikael Berglund provides expert guidance to the solutions available with individual chapters on the enforcement and recovery agents for each country, and in-depth discussion of relevant EU Law and Conventions. The second edition of Cross- Border Enforcement of Claims in the EU. History, Present Time and Future facilitates an in-depth understanding describing the background to the available remedies and includes commentary on works in progress highlighting developmental trends in this field. Cross- Border Enforcement of Claims in the EU. 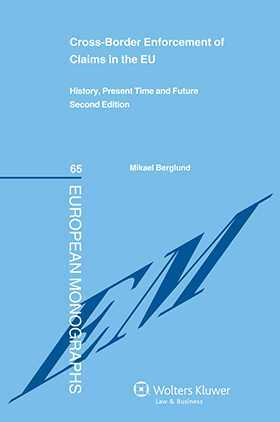 History, Present Time and Future – second edition is exceptional for its depth and breadth of coverage of the provisions of applicable legal instruments and case law at every level, including ECHR and ECJ level. This coverage combined with the insightful commentary will consolidate and enhance your understanding. Extensive coverage of applicable legal instruments includes the Brussels I Regulation, the European Enforcement Order for Uncontested Claims, the European Order for Payment Procedure, the European Small Claims Procedure, the Nordic Convention on Recognition and the Enforcement of Judgments in Civil Matters, the New York Convention on Foreign Arbitral Awards, the European Convention on Human Rights, the European State Immunity Convention, and the Vienna Conventions on Diplomatic and Consular Relations, as well as EC law on tax claims, the Recovery Directive, the OECD Convention on Mutual Administrative Assistance in Tax Matters, the Nordic Agreement on Assistance in Tax Matters, and EC lawandconventions on insolvency. Chapter 2 History and Legal Developments. Chapter 3 Enforcement and Recovery Agents. Chapter 4 Public International Law. Chapter 5 Scope of Application of EU Law and Conventions. Chapter 6 Procedures in EU Law and Conventions. Chapter 7 Harmonization of Civil Execution Laws. Annex 1 Overview of some subjects in the Recovery directive (2010/24/EU) and in the Implementing recovery regulation (1189/2011). Annex 2 Details on the entry into force and on certain reservations in relation to the States which are parties to the Convention on the recognition and enforcement of foreign arbitral awards of 10 June 1958. Annex 3 Agreement between the Nordic countries on mutual administrative assistance in tax matters of 7 December 1989, translation. Annex 4 Details on the entry into force in relation to the States which are parties to the Convention on jurisdiction and the enforcement of judgments in civil and commercial matters of 27 September 1968. Annex 5 Details on the entry into force in relation to the States which are parties to the Convention on jurisdiction and the enforcement of judgments in civil and commercial matters of 16 September 1988. Annex 6 Convention between Denmark, Finland, Iceland, Norway and Sweden regarding bankruptcy of 7 November 1933, as amended in 1977 and 1982, translated extracts. Annex 7 Draft of a Nordic agreement on the exchange of information in recovery matters, translation. Annex 8 Details on the entry into force in relation to the States which are parties to the European convention on State immunity of 16 May 1972. Annex 9 National authorities designated by the Member States of the European Union in accordance to Article 299 compared with Article 280 of the FEU Treaty for the erification of the authenticity of decisions of the European Court of Justice, Council or of the Commission. "A reliable guide for cross-border recovery of claims, in civil, commercial, and administrative matters. Very useful for practitioners."